Ryan Diatte #57b Won the Pro Dwarf Car Main Event And Preliminary Feature. White City, Oregon...August 3-4...Ryan Diatte won the 30 lap WSDCA Dwarf Car Nationals Pro Division Main Event Saturday night at Southern Oregon Speedway. The event was hosted by the local Southern Oregon Dwarf Car Association. Diatte competes with the South Bay and Nor Cal Dwarf Car Associations in California, and he was impressive all weekend. He won the Friday night Preliminary Feature and finished third in Saturday's Fast Dash to start third on the grid for the Main Event. Diatte was trailed by reigning Nor Cal Dwarf Car champion Danny Wagner. Wagner finished second in last year's race as well. Diatte charged into the lead at the start, followed by Wagner and Mark Hanson. Last year's winner, Cody Peters, brought out a lap one caution flag, and the restart saw another yellow flag when Josh King and Camden Robustelli tangled in Turn 2. Diatte led Wagner on the restart as Darren Brown took third from Hanson. A lap five caution flag flew for debris on the track. Diatte led Wagner on the restart as PHRA champion Ryan Martinez shuffled Brown back to fourth. Devan Kammermann spun in turn 2 for a lap 12 caution flag. Diatte continued to set the pace on the restart ahead of Wagner as Anthony Pope took third from Martinez. Cameron Diatte had a rough start to his weekend as he was unable to start his Friday night heat and was a B Main scratch. He raced past Kalvin Morton for fifth on lap 17. The drivers were battling hard for position throughout the pack in some two-wide and even three-wide racing. The leaders were in heavy traffic on lap 25. Ryan Diatte was having no problems up front, while Cameron Diatte took fourth from Martinez. Mac Marmon also got by for fifth and took fourth from Cameron Diatte right before a lap 27 caution flag for Kaycee Sheeler. Ryan Diatte maintained his lead over Wagner on the restart as Marmon slipped past Pope for third. Ryan Diatte drove a smooth and flawless race for a well earned victory. Wagner was a strong second, followed by Marmon, Cameron Diatte, Martinez, SODCA champion Brock Peters, Pope, Hanson, Morton and Tony Steffensmeir. 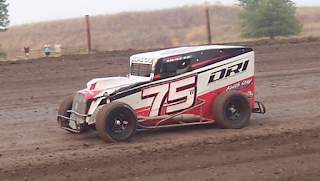 Reigning SBDCA champion Cameron Diatte #75b won the Pro Dwarf Car Main. There were 27 Pro Dwarf Cars in competition, and Hanson won the 10 lap Fast Dash on Saturday ahead of Wagner and Ryan Diatte, The rest of the competitors ran two ten lap heat races to determine the lineup for the 15 lap B Main. Tony Steffensmeir won the first heat ahead of Kyle Jones and Brock Peters. Cameron Diatte began his comeback for the night by winning his heat race ahead of Dustin Loughton and Sam Wren. Cameron Diatte led the B Main from the start for the win. Brock Peters raced past Tony Steffensmeir on a lap six restart to claim second, but Jones made it a battle for second with Peters for a few laps. Peters pulled ahead, and Zach Price took third from Jones on lap 12. Cameron Diatte won, followed by Peters, Price, Jones and Steffensmeir. 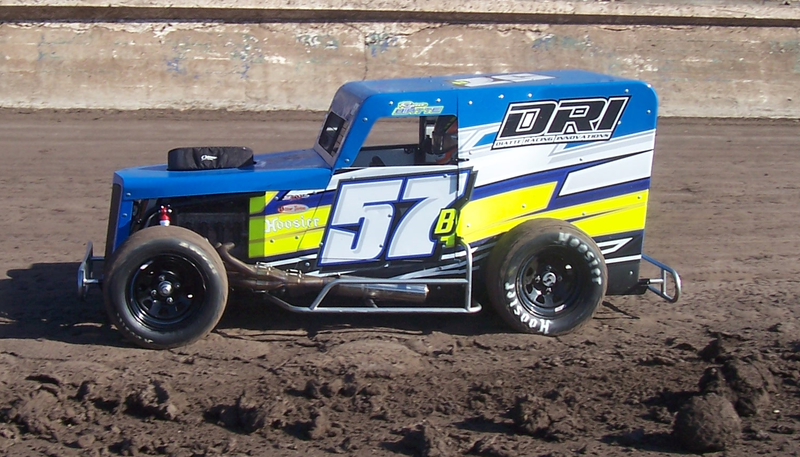 The Saturday Preliminary Feature saw Darren Brown set the early pace ahead of Ryan Martinez and Kalvin Morton. An inside move on the front stretch of the third lap briefly gained Martinez the lead, but Brown raced underneath him in Turn 4 a lap later to regain the position. Ryan Diatte took third from Morton before a lap four caution flag flew. Martinez led Ryan Diatte on the restart, and Sam Wren spun for a lap five caution flag. Ryan Diatte raced into the lead on the restart with Brown also getting by Martinez for second. Wagner raced around Martinez on the outside in Turn 1 on lap eight for third and began a good battle with Brown for second. A lap 11 yellow flag flew for Wren in Turn 4. Wagner took second from Brown on the restart as Ryan Diatte continued to lead the way. Wagner ran close the rest of the way in second, but Ryan Diatte prevailed at the checkered flag. Brown won a photo finish with Camden Robustelli at the line for third. Josh King finished fifth, followed by Martinez, Morton, Mark Hanson, Mac Marmon and Anthony Pope. 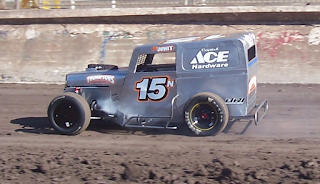 Darren Brown won the first of three ten lap heat races ahead of Hanson and King. Cameron Diatte had motor issues and scratched from that race. Martinez outran Wagner to win the second heat with Ryan Diatte third. Robustelli won the final heat ahead of Morton and Dustin Loughton. South Bay star Zach Price turned in a dominant performance in winning the 15 lap B Main. Randy Slater was a solid second ahead of Henry Corbin III, Toby Brown and Mason Lewman. Heat 2-Ryan Martinez, Danny Wagner, Ryan Diatte, Tony Steffensmeier, Brock Peters, Randy Slater, Brad Ernst, Henry Corbin III, Cameron Diatte. Heat 3-Camden Robustelli, Kalvin Morton, Dustin Loughton, Kyle Jones, Mac Marmon, Zach Price, Mason Lewman, Devan Kammermann, Kaycee Sheeler. B Main-Zach Price, Randy Slater, Henry Corbin III, Toby Brown, Mason Lewman, Sam Wren, Kaycee Sheeler, Devan Kammermann, Brad Ernst, Brady Beck, Cameron Diatte. Main Event-Ryan Diatte, Danny Wagner, Darren Brown, Camden Robustelli, Josh King, Ryan Martinez, Kalvin Morton, Mark Hanson, Mac Marmon, Anthony Pope, Devan Kammermann, Mason Lewman, Kyle Jones, Dustin Loughton, Toby Brown, Henry Corbin III, Randy Slater, Brad Ernst, Cody Peters, Zach Price, Tony Steffensmeier, Kaycee Sheeler, Brock Peters, Sam Wren. Dash-Mark Hanson, Danny Wagner, Ryan Diatte, Darren Brown, Josh King, Camden Robustelli, Ryan Martinez, Kalvin Morton, Anthony Pope, Mac Marmon. Heat 1-Tony Steffensmeier, Kyle Jones, Brock Peters, Mason Lewman, Devan Kammermann, Toby Brown, Randy Slater, Henry Corbin III, Cody Peters. Heat 2-Cameron Diatte, Dustin Loughton, Sam Wren, Zach Price, Jessica Clark, Kaycee Sheeler, Brady Beck. B Main-Cameron Diatte, Brock Peters, Zach Price, Kyle Jones, Tony Steffensmeier, Cody Peters, Jessica Clark, Dustin Loughton, Brad Ernst, Randy Slater, Toby Brown, Mason Lewman, Kaycee Sheeler, Devan Kammermann, Brady Beck, Henry Corbin III, Sam Wren. Main Event-Ryan Diatte, Danny Wagner, Mac Marmon, Cameron Diatte, Ryan Martinez, Brock Peters, Anthony Pope, Mark Hanson, Kalvin Morton, Tony Steffensmeier, Mason Lewman, Jessica Clark, Kyle Jones, Cody Peters, Devan Kammermann, Kaycee Sheeler, Zach Price, Brad Ernst, Toby Brown, Darren Brown, Josh King, Randy Slater, Camden Robustelli, Brady Beck. Tim Fitzpatrick #14d won the Veterans Dwarf Car Main Event And Preliminary Feature. 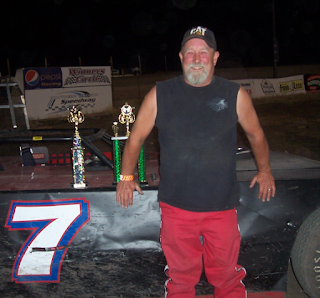 White City, Oregon...August 3-4...Nevada racer Tim Fitzpatrick won the 20 lap Veterans Dwarf Car Main Event Saturday night at the WSDCA Dwarf Car Nationals at Southern Oregon Speedway. The event was hosted by the local Southern Oregon Dwarf Car Association. Fitzpatrick is the 2016 race winner, and he turned in a dominant performance in winning the Preliminary Feature on Friday night as well. Fast Dash winner Mike Reeder gave Fitzpatrick a good run and led early before finishing second ahead of fellow Nor Cal racer and defending race champion Kevin Bender. Reeder had the pole and raced into the early lead ahead of Fitzpatrick and Fred Hay. The first of only two yellow flags flew on lap three for Don Gifford. After the final yellow flag on lap five, Buddy Olschowka went low in Turn 2 to take third from Hay, but Bender made an inside pass in Turn 4 on lap six to take third from Olschowka. In the later stages of the race, the leaders were in heavy traffic. Fitzpatrick made all the right moves and grabbed the victory. Reeder settled for second ahead of Bender. Kevin Miraglio finished fourth, followed by Olschowka, Hay, Eric Weisler, Mark Biscardi, Dan Geil and Jack Haverty. Reeder won the ten lap Fast Dash ahead of Weisler and Fitzpatrick. Kevin Miraglio won the first ten lap heat race ahead of Biscardi and Wade Ehrlich. Bill Van Praag outran Steve Walker and Steve Kapaun in the second heat. Kapaun blew a motor in his car in his heat race a night earlier and was borrowing the Brad Ernst car to race on Saturday. Kevin Bender #9n came from last starting to second in the Veterans Dwarf Car Feature. Kevin Bender had motor problems in his heat race and started last in the Friday night Preliminary Main Event. The race had to be restarted after Jack Haverty and Eric Weisler got together with Weisler riding the front wall, coming down and continuing. Fred Hay led Tim Fitzpatrick and Mike Reeder on the restart. The lead two cars ran closely up front, and Fitzpatrick made an outside pass on the front stretch to take the lead from Hay on lap four. Haverty and Mitch Sheeler tangled in Turn 4 for a lap six caution flag. Fitzpatrick led Hay and Brian Quilty on the restart, and Bender was already up to fourth. Bender and Buddy Olschowka both got by Quilty on lap 13. As Fitzpatrick led the way to the checkered flag, Bender made a last turn pass on Hay for the second place finish. Hay settled for third, followed by Olschowka, Quilty, Glenn Sciarani, Weisler, Dan Geil, Haverty and Mike Reeder. Hay won the first ten lap heat race ahead of Weisler and Sheeler. Both Bender and Steve Kapaun had their motor problems in that heat race. Fitzpatrick won the second heat ahead of Mark Biscardi and Bill Van Praag. Reeder won the final heat race ahead of Quilty and Haverty. Heat 1-Fred Hay, Eric Weisler, Mitch Sheeler, Wade Ehrlich, Dennis Hively, Don Gifford, Steve Kapaun, Kevin Bender. Heat 2-Tim Fitzpatrick, Mark Biscardi, Bill Van Praag, Dan Geil, Henry Corbin II, Austin Quilty, Kevin Miraglio. 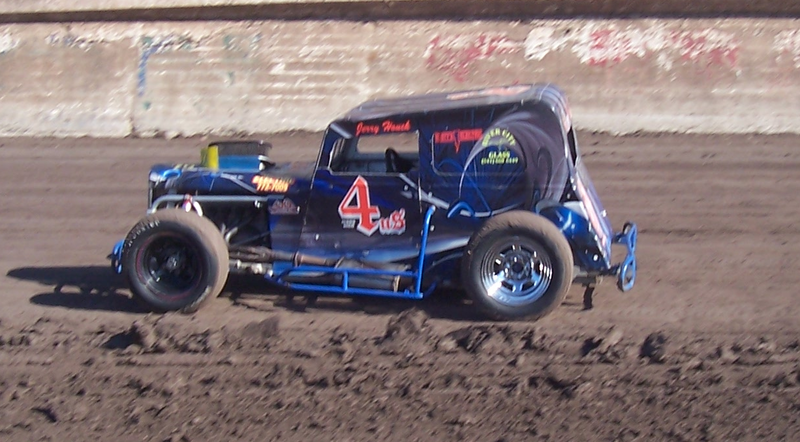 Heat 3-Mike Reeder, Brian Quilty, Jack Haverty, Glenn Sciarani, Buddy Olschowka, Tommy Brown, Eddy Claessen. Main Event-Tim Fitzpatrick, Kevin Bender, Fred Hay, Buddy Olschowka, Brian Quilty, Glenn Sciarani, Eric Weisler, Dan Geil, Jack Haverty, Mike Reeder, Bill Van Praag, Tommy Brown, Henry Corbin II, Dennis Hively, Austin Quilty, Kevin Miraglio, Mitch Sheeler, Wade Ehrlich, Don Gifford, Eddy Claessen. Dash-Mike Reeder, Eric Weisler, Tim Fitzpatrick, Fred Hay, Brian Quilty, Kevin Bender, Dan Geil, Buddy Olschowka, Glenn Sciarani, Jack Haverty. Heat 1-Kevin Miraglio, Mark Biscardi, Wade Ehrlich, Henry Corbin II, Dennis Hively, Austin Quilty, Don Gifford. Heat 2-Bill Van Praag, Steve Walker, Steve Kapaun, Tommy Brown, Eddy Claessen, Mitch Sheeler. Bill Van Praag, Henry Corbin II, Tommy Brown, Wade Ehrlich, Eddy Claessen, Austin Quilty, Dennis Hively, Don Gifford, Mitch Sheeler, Glenn Sciarani. 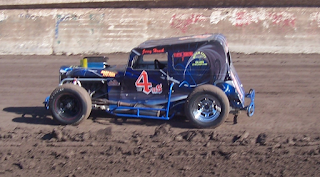 Brett James #4us won the Sportsman Dwarf Car Main Event. 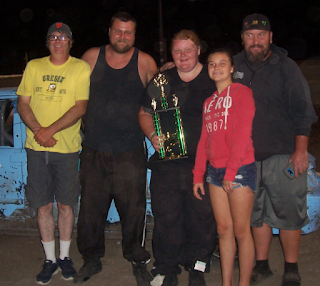 White City, Oregon...August 3-4...Third generation racer Brett James won the 15 lap Sportsman Dwarf Car Main Event Saturday night at the WSDCA Dwarf Car Nationals at Southern Oregon Speedway. The event was hosted by the local Southern Oregon Dwarf Car Association. James had been in contention for the win on Friday before the leader spun and he couldn't avoid the crash. This time, he gained the lead on the fourth lap and led the rest of the way. Fast Dash winner Shawn Whitney set the early pace ahead of James and Joe Sanders. A low pass in Turn 4 of the fourth lap gained James the lead, and Erin Morganstern spun in Turn 4 for a caution flag. James led Whitney on the restart as Michael Johnson raced around Sanders for third. Sanders made an inside pass in Turn 2 of the sixth lap to take third back from Johnson. Whitney spun in Turn 2 for a lap eight caution flag, and he ended up retiring from the race. James led Sanders and Johnson on the restart. A low pass in Turn 2 of the 11th lap gained Johnson second. However, nobody could catch James as he led the SODCA podium sweep of Johnson and Sanders. Morganstern settled for fourth, followed by Mack Aceves, Ashleigh Strain and Whitney. 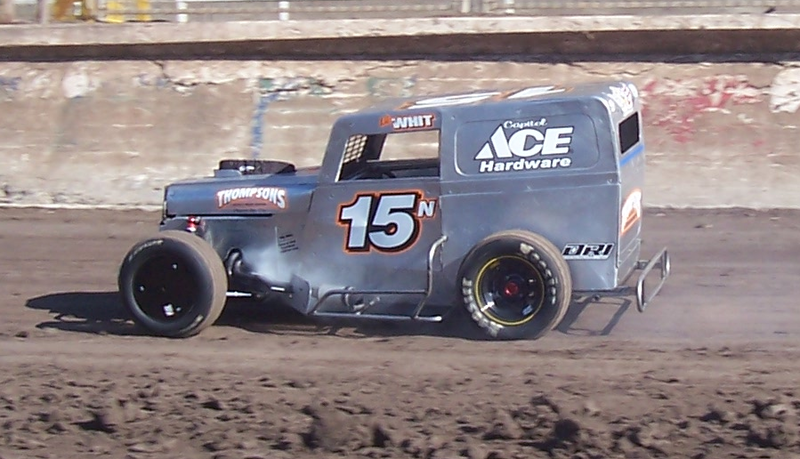 Shawn Whitney #15n won the Sportsman Dwarf Car Preliminary Feature and Fast Dash. 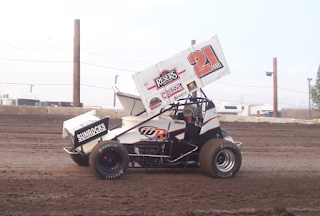 On Friday night, Brett James won the ten lap heat race and raced into early lead in the Preliminary Feature. Whitney was second, and he made a high pass in Turn 2 of the third lap to take the lead from James. Joe Sanders was running third. As they worked lap five, Whitney spun in Turn 2 and was hit by James, ending the race for James. Whitney led Sanders and Erin Morganstern on the restart. Morganstern briefly took second from Sanders on lap ten before spinning. Michael Johnson was now third behind Sanders. Whitney led the rest of the way to win, followed by Sanders, Johnson, Ashleigh Strain, Mack Aceves, Morganstern and James. Heat 1-Brett James, Joe Sanders, Shawn Whitney, Erin Morganstern, Michael Johnson, Mack Aceves, Ashleigh Strain. Main Event-Shawn Whitney, Joe Sanders, Michael Johnson, Ashleigh Strain, Mack Aceves, Erin Morganstern, Brett James. Dash-Shawn Whitney, Joe Sanders, Brett James, Ashleigh Strain, Michael Johnson, Mack Aceves, Erin Morganstern. Main Event-Brett James, Michael Johnson, Joe Sanders, Erin Morganstern, Mack Aceves, Ashleigh Strain, Shawn Whitney. 2016 champion Jake Wheeler #21 made his first appearance of the season and won the Kendall Oil Winged Sprint Car feature. White City, Oregon...August 4...Taking the lead from TJ Winningham, Jake Wheeler went on to win the Kendall Oil Winged Sprint Car Main Event Saturday night at Southern Oregon Speedway. This was the first appearance of the season for the 2016 champion, who has been competing at various different Winged 360 Sprint Car shows on the West Coast. Wheeler pilots the Reser's Fine Foods Sprinter, and his return was made possible thanks to a motor provided by Chuck Prather. 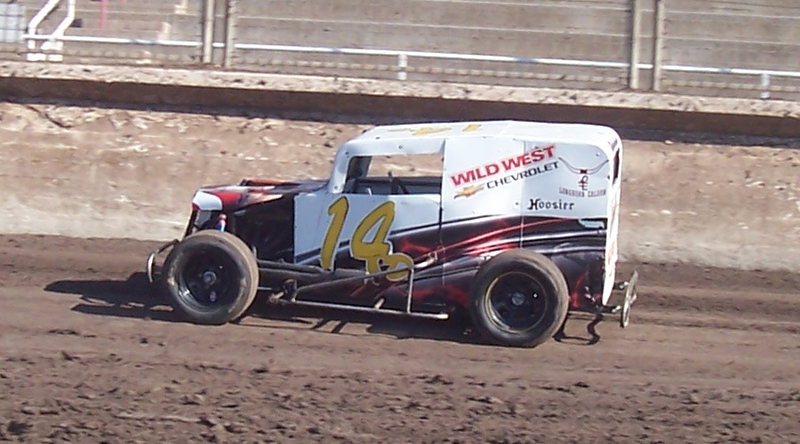 David Hibbard won the first ten lap heat race ahead of Charlie Thompson. Aaron Miller impressed with his first heat race win of the season ahead of Mike Wheeler, but Wheeler suffered mechanical issues in the process to end his night. Winningham grabbed the pole for the Main Event with his win in the six lap Scramble. 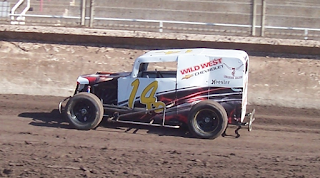 Thompson was running second before motor troubles sidelined him and handed second to Jake Wheeler. Winningham raced into the lead at the start of the Main Event with Jake Wheeler second and David Hibbard third. Wheeler made a Turn 2 pass on Winningham on lap seven to take the lead. Hibbard made an outside pass on the back stretch of the 12th lap to grab second from Winningham. A lap 15 caution flag flew for Blaine Cory, and Miller retired from the race. Jake Wheeler continued to lead David Hibbard and Winnigham on the restart. A final caution flag flew on lap 23 when Cory and Bailey Hibbard got together in Turn 3, ending the race for Hibbard with front end damage. The caution flag didn't stop Jake Wheeler as he led the final two laps for the impressive victory. David Hibbard finished second, and Cory made a last turn pass on Winningham to finish third. Jeffrey Hudson settled for fifth ahead of Kyler Barraza, Bailey Hibbard and Miller. The Kendall Oil Winged Sprint Cars will run the $2,000 to win Iron Head Nationals next Saturday night. Also on the card will be the Bobbio's Pizza Mini Stocks, JOAT Labs Hornets and SODCA Dwarf Cars. For further information, go to www.southernoregonspeedway.com. Heat 1-David Hibbard, Charlie Thompson, Jeffrey Hudson, Jake Wheeler, Blaine Cory. Heat 2-Aaron Miller, Mike Wheeler, TJ Winningham, Bailey Hibbard, Kyler Barraza. Scramble-TJ Winningham, Jake Wheeler, Aaron Miller, David Hibbard, Jeffrey Hudson, Charlie Thompson. Main Event-Jake Wheeler, David Hibbard, Blaine Cory, TJ Winningham, Jeffrey Hudson, Kyler Barraza, Bailey Hibbard, Aaron Miller, Mike Wheeler NS, Charlie Thompson NS. Bree Tritchler #17 stayed in title contention with her first career JOAT Labs Hornets feature win. White City, Oregon...August 3...After an early battle with point leader Tim Hedges, Bree Tritchler won her first career JOAT Labs Hornets Main Event Friday night at Southern Oregon Speedway. Tritchler won by over half a lap and used the finish to move to within point of Hedges, who settled for a fourth place finish. The star of preliminaries was Dylan Irving, who won both his six lap heat race and the four lap Trophy Dash. Tritchler was the other heat winner. Tritchler raced into the early lead ahead of Hedges and Irving. On lap four, Tritchler got out of shape exiting Turn 2, allowing Hedges to race by for the lead. Roseburg visitor Jeremy Mayfield took third from Irving. An inside move in Turn 2 of the sixth lap regained Tritchler the lead as Irving also regained third. Tritchler had a straightaway advantage over Hedges by lap ten, and Irving was being challenged by Brandon Wonsyld in a good race for third. A high move in Turn 3 of the 17th lap gained Wonsyld third. Wonsyld went high around Hedges for second in Turn 1 of the 18th lap, and Irving made an outside pass on Hedges for third in Turn 4. However, Tritchler had checked out on the field for the impressive victory. Wonsyld settled for second, followed by Irving, Hedges, Mayfield. Chris Boynton, Jenna Hedges and Dylan Sauer. The JOAT Labs Hornets return this week as part of the Iron Head Nationals Kendall Oil Winged Sprint Car show. Also on the card will be the Bobbio's Pizza Mini Stocks and SODCA Dwarf Cars. For further information, go to www.southernoregonspeedway.com. Heat 1-Dylan Irving, Tim Hedges, Chris Boynton, Dylan Sauer, Zach Nelson. Heat 2-Bree Tritchler, Jeremy Mayfield, Jenna Hedges, Brandon Wonsyld. Trophy Dash-Dylan Irving, Tim Hedges, Bree Tritchler, Dylan Sauer. Main Event-Bree Tritchler, Brandon Wonsyld, Dylan Irving, Tim Hedges, Jeremy Mayfield, Chris Boynton, Jenna Hedges, Dylan Sauer, Zach Nelson NS. 2016 champion Lee Doty #7 swept the Valley Store All Late Model Lites action. White City, Oregon...August 4...Lee Doty won the 15 lap Valley Store All Late Model Lites Main Event Saturday night at Southern Oregon Speedway. The win capped a clean sweep of heat, Trophy Dash and Main Event for the 2016 champion. With Greg Arnold absent due to prior commitments, point leader Charlie Eaton took a big step towards the championship with second place finishes in all three races. Mechanical issues sidelined both Dusty Aos and his father Eric Aos before the Main Event. Doty had the pole for the Main Event and raced into the lead ahead of Eaton and Danny Prewitt. Doty had a straightaway lead when Prewitt spun for a lap seven caution flag. Doty continued to lead the restart and built another straightaway lead before the checkered flag. Eaton settled for second ahead of Prewitt. The Valley Store All Late Model Lites return on September 8th along with the Kendall Oil Winged Sprint Cars, Late Models, Bobbio's Pizza Mini Stocks and JOAT Labs Hornets. For further information, go to www.southernoregonspeedway.com. Heat-Lee Doty, Charlie Eaton, Danny Prewitt, Dusty Aos, Eric Aos. Trophy Dash-Lee Doty, Charlie Eaton, Eric Aos, Danny Prewitt. Main Event-Lee Doty, Charlie Eaton, Danny Prewitt, Eric Aos NS, Dusty Aos NS.